How Are Alligator Eggs So Unique? Are Alligators Going to Take Over The South? The last time I was in central Florida, I was surprised by the number of alligators that lived in the ponds and bogs that are everywhere. I was told they migrate from one to another, and children do not fear swimming in a water hole where an alligator resides, that is, on the other end of the pond, of course. Alligators and crocodiles are often confused. In the US, if you spot one unless you are in the southern tip of Florida, it is surely an alligator. 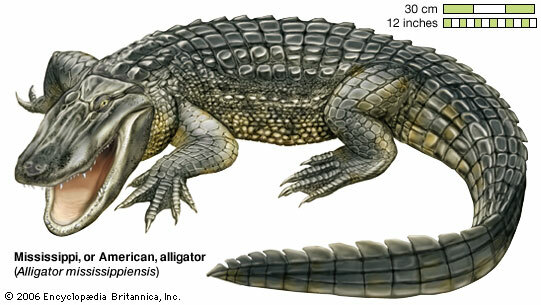 The main difference is the bony ridge in front of the eyes on a crocodile, not found on the alligator. The alligator is the one that looks like he’s smiling all the time. That is the only appearance, however. The female alligator lays her eyes in private, on high ground away from others. Once a place is selected, she works at clearing an area 8 to 10 feet across. Then she gathers vegetation and begins piling it onto the spot. Layer after layer is bought in, and then she hollows out a place in the middle for her eggs. It takes her 3 days to make this nest but now it is ready. She lays 20-70 three-inch eggs in the center of this pile, then covers them completely. During the next 9-10 weeks, she will keep this vegetation moist, for the heat of decomposition of the dead plants keeps the eggs between 80 and 100 degrees, perfect for the baby’s development. Each egg contains really two concentric shells. The outer hard shell will crack as the baby alligator grows. But the inner shell will flex and will need to be broken. A caruncle or egg-tooth has developed on the snout of the alligator, perfect for breaking through this shell. 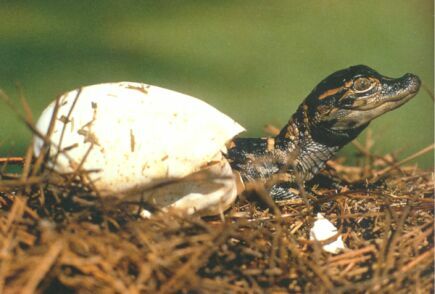 In short order, out of the 3-inch egg emerges an 8-inch alligator baby! The baby immediately heads for the water and, since it already has several teeth, it is able to hunt and feed itself. However, it stays close to the mother for the first two years of life, enjoying her protection. With so many eggs hatching, it might seem surprising that alligators don’t take over the southern states. But in truth, they have many enemies, so many, in fact, that perhaps only 1 alligator in 100 lives to be three years old. If they do survive, by the time the male is 20 he is about 16 feet long, and the female about 10 feet long. They might live over 50 years if enemies don’t get them. Does God’s Plan Show In the Alligator? The hatching of alligator babies is another marvel of creation. While evolutionists somehow try to relate eggs and hatching to similar skills in birds, there is obviously little other resemblance! Instead, why not admit the Creator had a perfect plan and used it for both.